There is a massive sea change afoot for one of the most important stock market participants. While the footprints left by the US retail investor are easy to decipher, their rationale is a bit murkier to ascertain. For a while now, I’ve been pointing out the equity exodus by average Joe and Jane. But retail investors haven’t just been taking their chips off the table. Fund flows into fixed incomes have been positive at a rate that is almost beyond belief. While many are pointing out the formation of an impressive bubble in fixed income, and others fretting at the tsunami of supply (paper issued by the US government), the real story is the demand side of the equation. There are very few Treasury bulls out there. Hugh Hendry of Eclectica and David Rosenberg of Gluskin Sheff are two that come to mind (if you know of others, let me know). Rosenberg has been consistently writing about the secular shift as he believes it is one of the most powerful changes in the market right now. Households own $18.2 trillion of residential real estate, even after the value destruction of the past three years. Households own $18.1 trillion of equities, despite the vicious bear market. Households own a near-record $7.7 trillion of deposits and cash — earning next to nothing in yield. Households own $4.6 trillion of consumer durable goods. Households own just $800 billion in Treasury notes and bonds. Presented with those basic facts, it is not difficult to put the pieces together. The average household’s wealth is very underrepresented in fixed income. Some of that has to do with the strong equity culture in the US. You simply won’t find the same comfort level with equity ownership and trading in Europe for example. The key is that there seems to have been a moment of epiphany where the average Joe and Jane realized that their balance sheet was very lopsided. No doubt that eureka! was sparked by several painful events: the real estate meltdown, the stock market bear market (on heels of the 2000 bear market, giving a zero decade long return) and the economic meltdown which either reduced or eliminated incomes (through the steep rise in unemployment). The result is that the babyboomers, facing a looming retirement, have retreated into the posture of capital preservation and income generation. 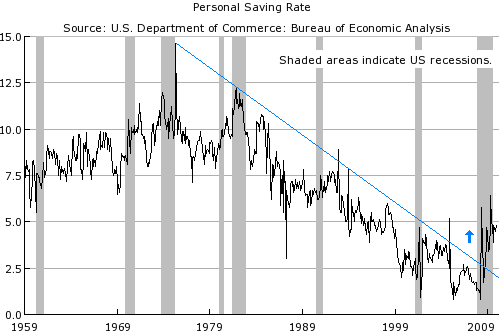 The US savings rate tells the story of the ferocious deleveraging going on in the private sector in the US. After amassing debts and consuming way beyond their means, the US consumer has hit the wall and rediscovered the religion of fiscal prudence. So while the public sector’s balance sheet is expanding like crazy to fight against the recession, the key question is will this private trend going the opposite direction nullify it? The last little bars are partial data for February (so I colored them differently). Even with just the partial data for February, we are still going at a pace to match January’s fund flows. Needless to say, Rosenberg feels that the long term secular bull market in treasury notes is intact and any dips are buying opportunities. He believes that the deleveraging by the private sector will overpower the US government’s expansionary policies and ultimately bring about more deflation. So there you have the other side of the fixed income story (from someone much smarter than yours truly). tony, yeah, there’s a lot of that going on. Did you catch the interview with Michael Belkin? Gary Shilling is also a big advocate of owning treasuries. In fact, he recommends owning 30yr treasuries as he thinks they are headed back to have a 3 handle. Needless to say he is very bearish on stocks. paul, thanks. I had read Shilling talking about this a while back. He’s been consistent about this for almost a year, no? this is basically a deflation vs. inflation story. Which monetary force wins over the other. The ultimate economic smack-down. but it´s a bit sad that you need to wait on Rosenberg to start considering that there may be more to these fund flows than pure fear. 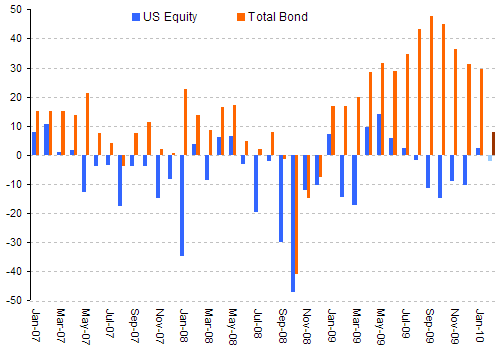 Green, I’ve already hinted at it a few times: Liquidity Ratios and Cult of Equities. This time I wanted to give the other side a more detailed exposition. In any case, a historical study of the bond market shows that when we are at these price levels, it is not a good time to buy. Will this time be different? Those are the famous last words always, aren’t they? steve kaplan is a huge fan of tlt right now. So am i.
joel, never heard of the guy. Are you referring to this guy? when i watch and read the media/blogosphere “stay away from bonds, short treasuries” has become a common theme on wall street. the yield curve is at record steepness. ->at the long end the market already priced in rising interest rates! i agree that fed funds rates will rise. and thats a reason to stay away from short to midterm bonds. but imo one cannot automatically conclude that once the fed starts raising fed funds rates that this will automatically hit the long end. it is completely possible that the curve would start to flatten (anticipating the next dip) thereby hurting long bond investors not that hard. a major factor that influences long term yields are inflation expectations. they have already recovered to an “old normal” of 2.5-3%. so to move yields dramatically higher you would not only need the fed starting to hike short term rates but also a spike in inflation expectations. ->we all agree that the fed will have to hike to reflect more normal conditions. but will everybody agree that inflation expectations get out of hand to a higher “new normal”? the latest readings still indicate pressure in the PPI that has to be absorbed by corporations since the CPI shows no signs of acceleration. then there is the dollar. if it stays around the current levels for the rest of the year this will be highly dis-inflationary. common sense is that a strengtening economy a tightening fed will favour a rising dollar. that doesnt fit the inflationary picture too. -when will the fed start raising rates? -how will the yield curve react to that? -will inflation expectations get out of hand? -will the dollar be inflationary or deflationary? ->to me there is absolutely no certainty that todays bond buyers will have to lose money. it will take a lot more than rising fed funds rates to put significant pressure on long term rates. if the required events happen and even more so WHEN they happen defines the succes of investing in bonds today. have a look at the orange (10y) and brown (3m) line and how they behaved during the feds tightening from 2003 to mid 2005.
and then ask yourself if they will be able/willing (10% unemployment) to hike fed funds at the same pace in the years to come? long term rates certainly can move higher. but until that happens the investor happily collects a safe 3.70% per annum and is immune to any downturns in the stock market. note: this is my take on treasuries. corporate bonds are a completely different playfield. spreads are too tight imo. but at the moment (and maybe even for the future) - the steady fund flows could provide a new normal of demand setting a new normal for spreads.